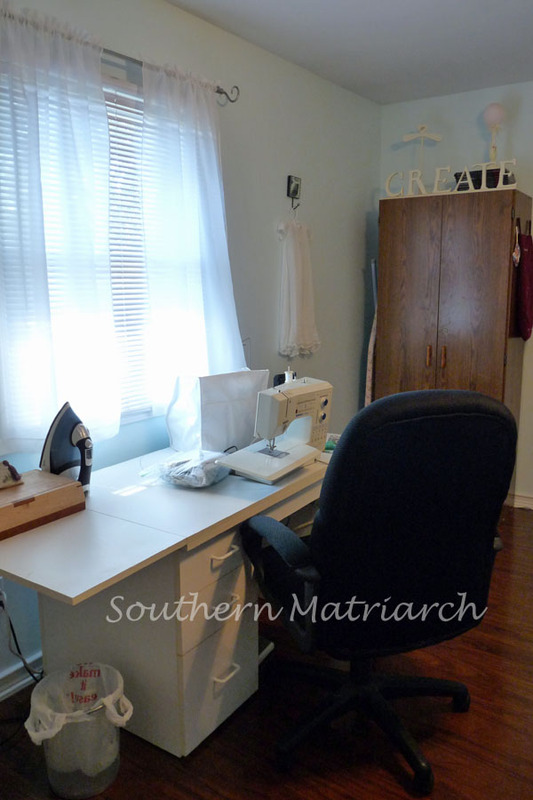 Welcome to my new sewing room. In no way is this room opulent or over the top. 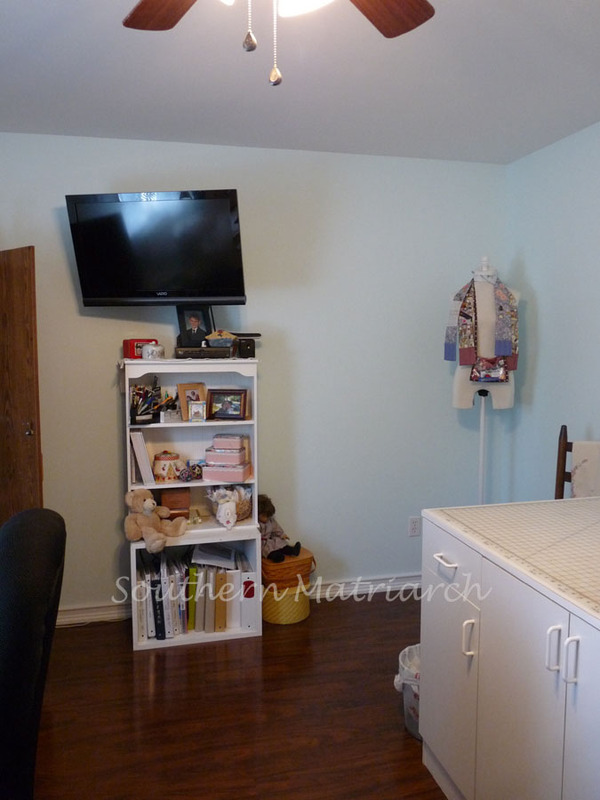 I just wanted a larger space that was less cluttered. Since the room I had been in will be a guest room, my craft/painting supplies remain in the previous closet. And the dressers in there hold patterns and kits. I will share that with you another day. The wall color is "Stillness" by Valspar available at Lowes. As I posted before, I was going for calm and serenity. The laminate flooring is Vera Mahogany by Pergo, also available at Lowe's. I showed a couple of before pics here. 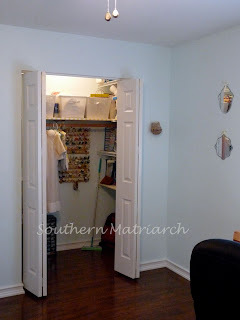 The "Victoria Secret" stripes on the walls were a challenge to cover but they have been replaced by this seaglass aqua blue color. I really like it. So for a little tour. Remember you can click on the photos for a closer look. This is what you see when you first enter the room. 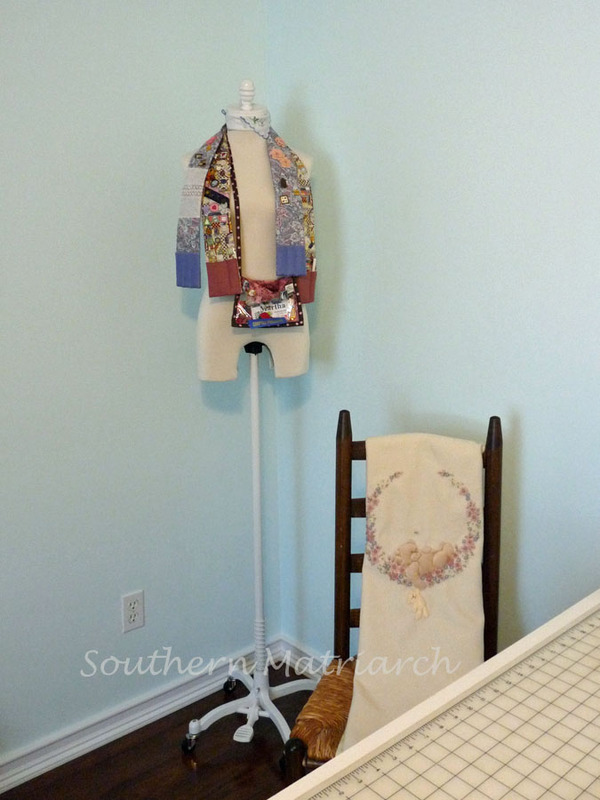 My machine table has a turntable in the center with my Bernina 1130 on one side and my hated Elna serger on the other. I can turn the table top to switch machines. The box on the corner is a jewelry box my father made for me. I don't have a lot of jewelry but I do have several pairs of scissors. So scissors are stored in there. 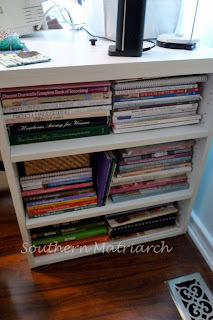 On the far side of my sewing table are mostly heirloom sewing and embroidery books. Tucked on the left side of the center shelf is a basket of my treasured antique buttons I use on most of my baby things. I need a larger basket. The thought scares my husband. This is a before shot. The curtain or "scarf" as you will, is the fabric I used for the new curtains. That is kind of misnomer. 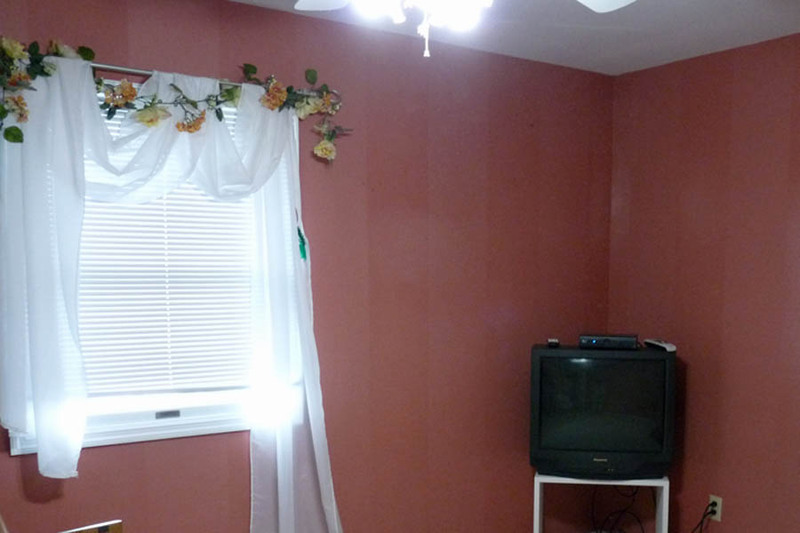 Window covering is a better term. No the word fabric is the misnomer. Spun plastic is a better description. Some kind of cheap polyester that I whacked into two pieces, hemmed and put back on the rod. I wanted something breezy and light. And free was even better. This ancient cabinet is screw together furniture at its best. It was originally purchased as a pantry cabinet when we moved into base housing that had no pantry. Almost 20 years ago. It now houses my magazines. I had planned to paint this white before it went into the room but it came down to wait 6 weeks to paint it or finish the room. You see what choice was made. Continuing around the room is a carpy "bookcase" and a TV that says "look at me!" Don't send a man to the store with the scant instructions of "Buy a small TV for my sewing room." I could host superbowl parties in here with this monstrosity! At least it is mounted on the wall and out of the way. The bookcase for lack of a better term will be replaced soon, just haven't had time. It holds pictures of the kids, class notebooks, vintage hankies and some miscellaneous things. In the tins are my DMC 50 weight, rayon andmetallic machine threads. 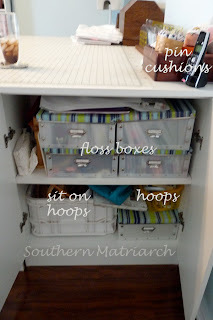 Sitting next to the shelf is a Longaberger sewing basket, a well loved American Girl doll and a vintage sewing basket. Meet Gertrude. She came to live in my sewing room when DD #2 used to work in retail. Now she holds my convention name tag holder and some chatelaines my girlfriend and I made together. Next is an extra chair. I never seem to be alone in here so I might as well give them a place to sit. On the chair is a Jan Kerton teddy bear blanket. As seen in the picture above with the stadium television is my cutting "table." It is made up of inexpensive storage cabinets from Lowe's. My DH and son screwed them together and placed a 4 x 8 piece of laminated MDF on top. It holds my large cutting mat. It is wonderful and also hazardous. I am dangerous around a horizontal surface. I can fill it faster than you can blink. The cabinets hold an assortment of supplies. The cabinet on the far end holds what my daughter calls "construction notions." 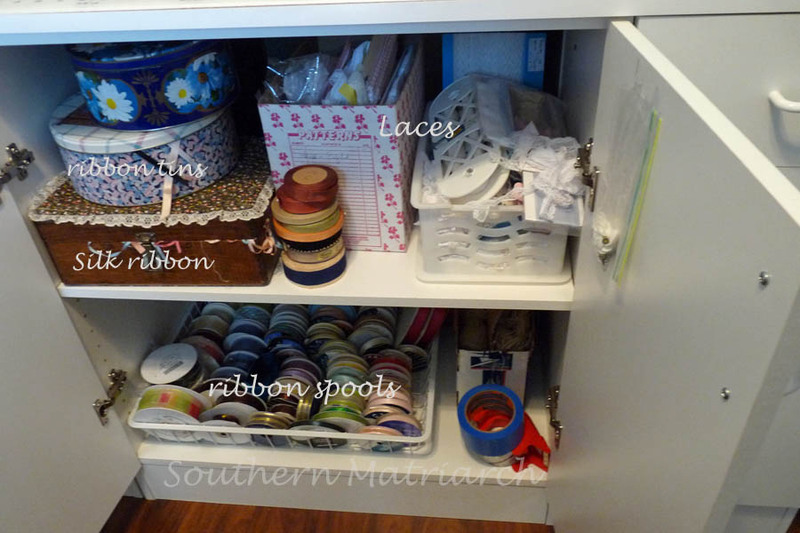 The center front cabinet holds ribbons and lace. There is a dead space behind here where a large tote holds batting and poly fibrefill. 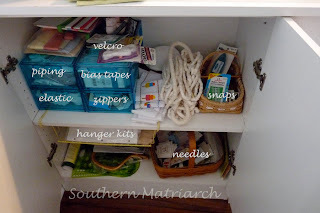 The two small cabinets on either side of this one holds ironing supplies and the other serger threads and beads. In one of the drawers are my rotary cutters and pattern weights. The other drawer holds plastic baggies in assorted sizes. The cabinet on the other end was dubbed "embroidery." It houses flosses, threads and hoops. On top of the cutting table is my pleater to the far left, rulers and pincushions. To the right of that is my love me wall of prize ribbons. Most of these are from the State Fair. I didn't enter anything this year, way crazy summer and everything I would have entered was being worn. So I am ahead of the game for next year! That small stack in front of the pleater is christening gown fabrics, pattern etc. 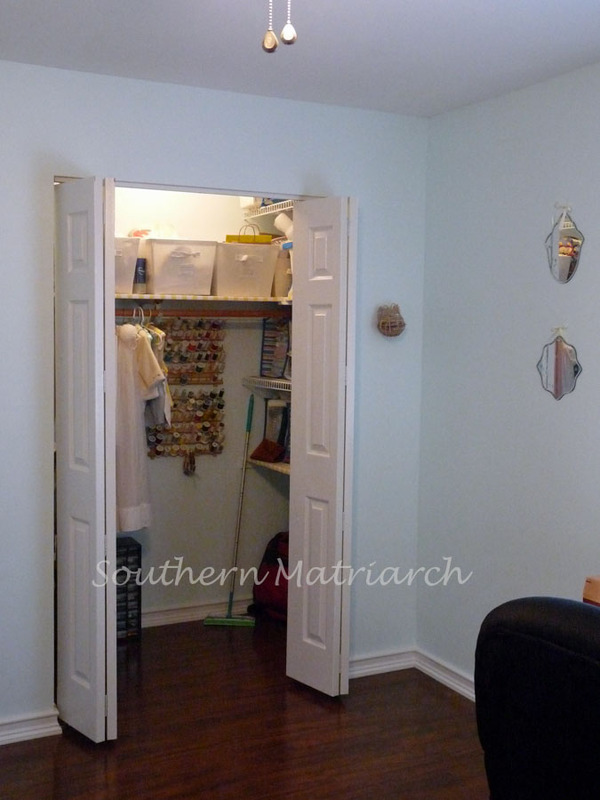 There is a small wall space between the door and the closet. 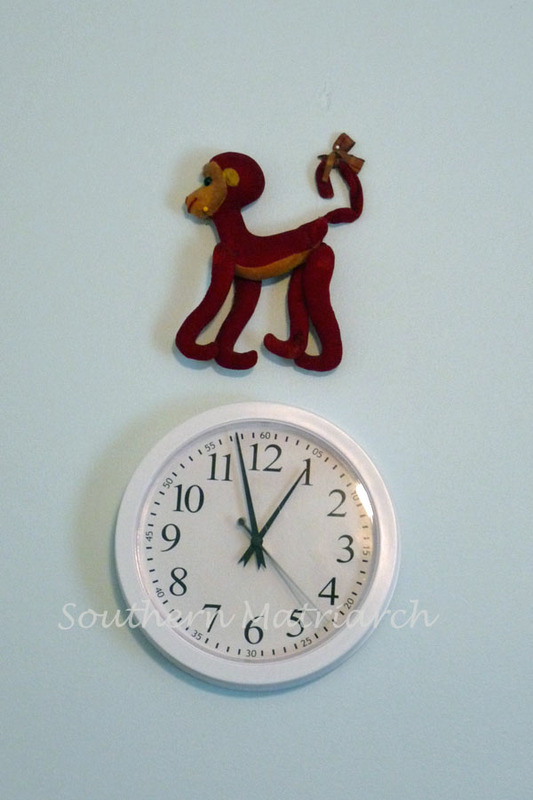 You have all seen what a clock looks like, but the ugly little monkey above it is very dear to me. It belonged to my best friend. It hung over every bedroom door she had save one until her death in 2004. He looks a little tired for his 53 years, but there he shall remain. Next comes the closet. 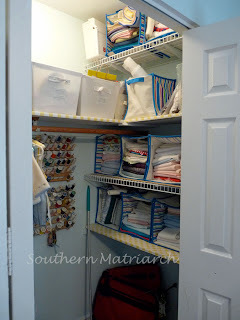 Many of you have heard me talk about or read about my paring down of my stash. I am amazed at how small it is compared to what it used to be. 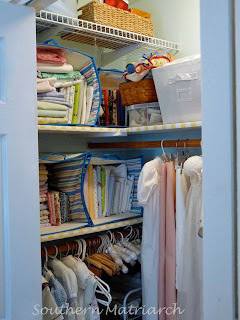 I was able to keep the floor of the closet fairly clear and leave the hanging rods in place. This is the right side of the closet. My fabrics are sorted according to type. We'll visit the kinds of fabrics in another post. Ignore the broom handle. 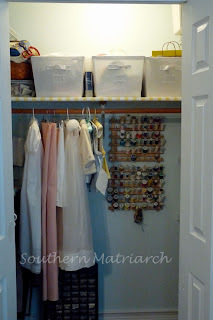 The bins that store my fabric were purchased on sale several years ago at The Container Store. I never realized, or don't remember knowing until now that there are two different sizes of them. 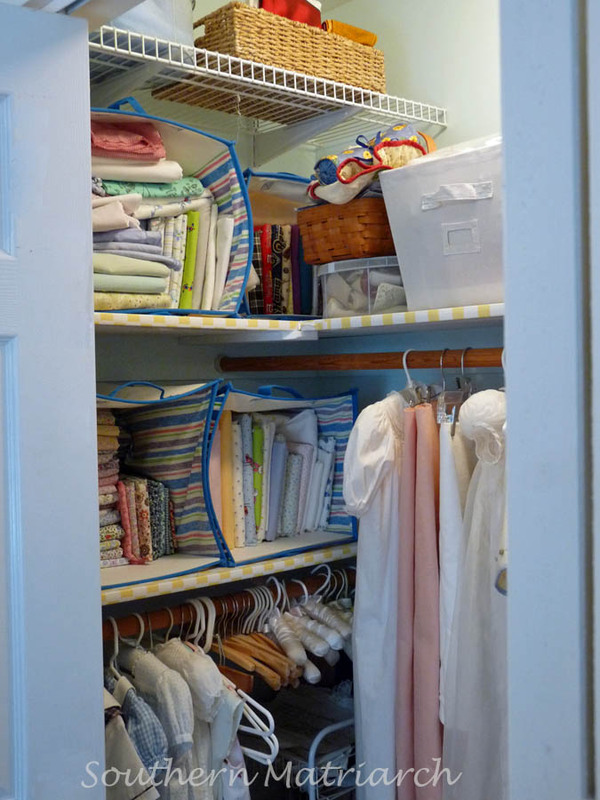 This is the left side of the closet. Hanging on the rod are class garments that haven't been grown into yet, or items from my children. In the center are a couple of christening gowns awaiting return to their owners. The bins on the center shelf hold works in progress. 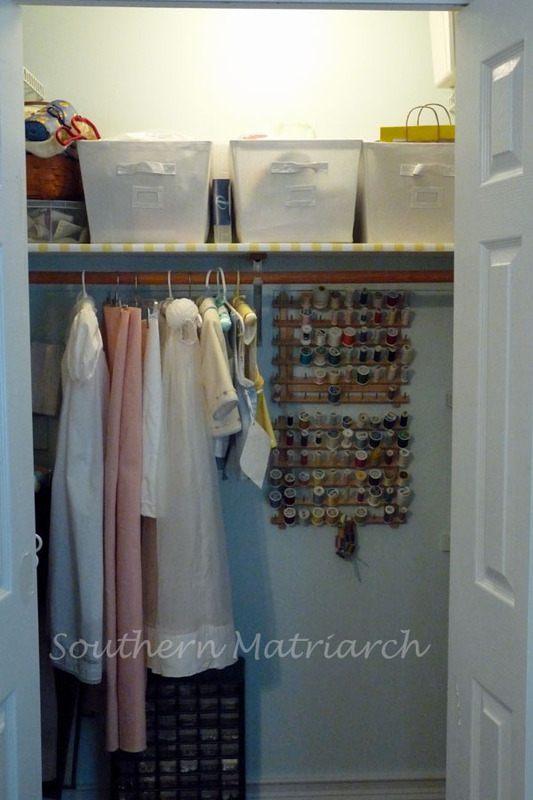 I decided to mount the thread racks on the closet wall to keep the room itself less cluttered. I haven't mounted the button bins yet. In keeping with truth in reporting; in the first pictures you might have spied my ironing board slid in next to the pantry cabinet. There is a space for it but to be honest, it will rarely live there. Here is where it will live. 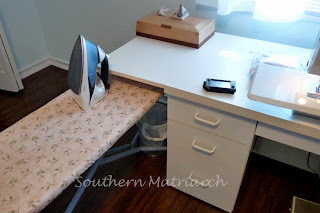 I sew with my ironing board right next to me at a 90 degree angle to my chair. It sure saves time. Another item I purchased was 3 additional trash cans for this room. Target had them for $2.50, so I bought three. I am a trashy person in my sewing room evidently and the can was constantly overflowing. Perhaps having more trash cans will help that. I am loving having the flooring in here as opposed to carpet. I can slide all over that room in my chair and a quick "swiffer" clears the floor of debris. I would like to say that my space will always look like this, but you would hear my family screaming if I did. They know better. For now it is clean and tidy. I hope you enjoyed this little tour. More to come. Keep stitching faithful readers. Loved the tour! What a great time I had, coffee in my hand, peeking into your world. Thanks friend. Love it and thanks for the decorator's tour! 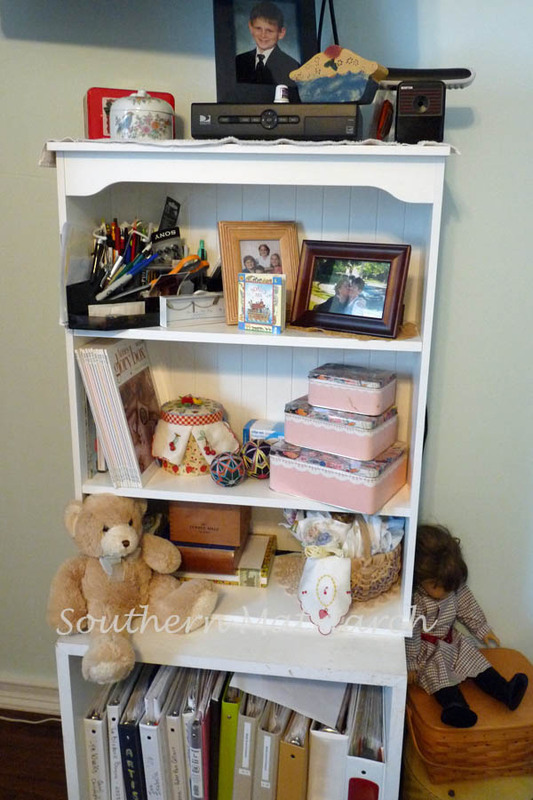 It looks very functional and organized and pretty as well with all your beautiful heirloom work. 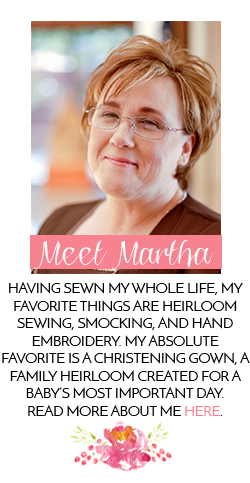 Oh Martha...your new room looks so soothing & nice & clean & FRESH! I bet you are dying to spend more time in there. 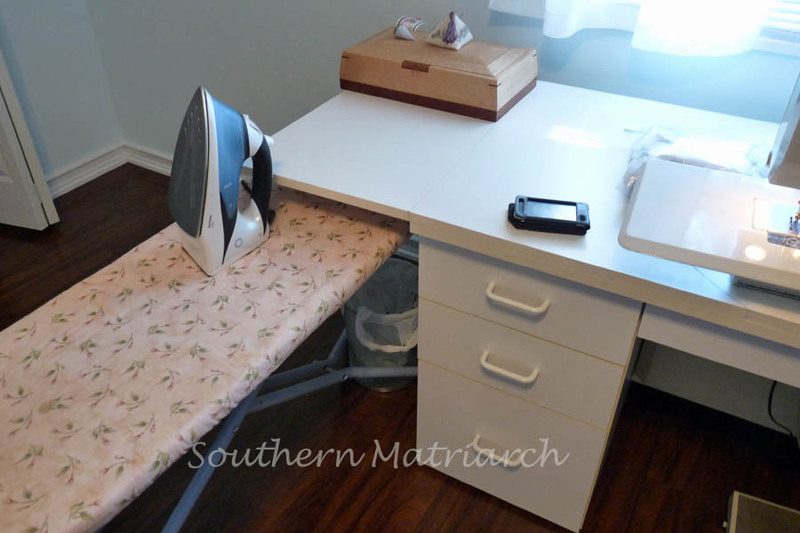 Your "cutting table" is positively AWESOME! 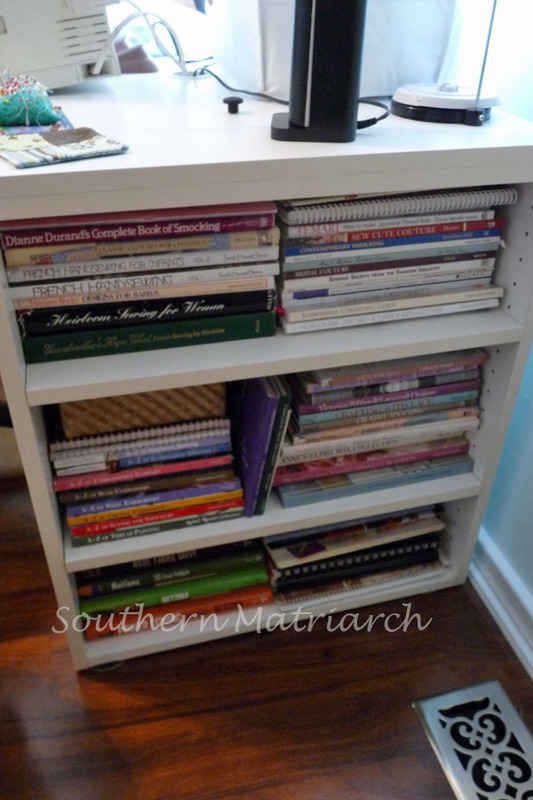 Great idea for some wonderful storage. Tell me more about that awesome iron I see in pic #2, please?? My Shark is dying & I've killed 2 Rowenta's in my life. Still looking for the 'perfect' iron. 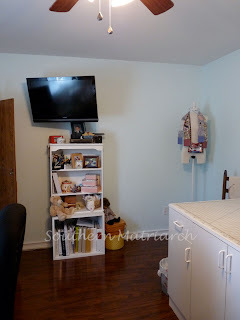 Your wonderfully creative talents deserve such a nice room! Congrats! Martha, It turned out fantastic! 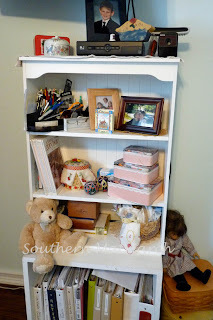 Thank you for sharing your storage ideas! I am in awe of the floor. Without stuff piled all over it and I want one!! 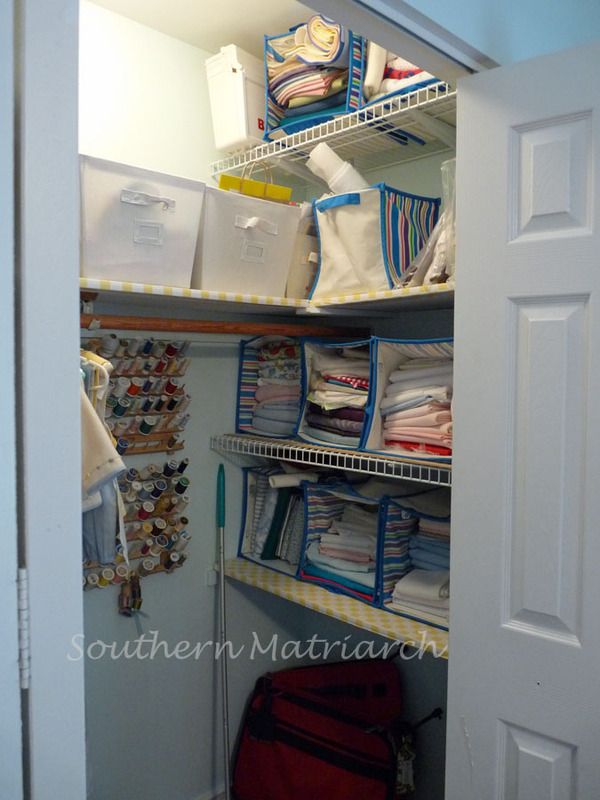 It amazes me how inviting a tidy and organized room sewing room is. Like a blank sheet of paper just waiting. Your post is encouraging and has some good ideas. Thanks. It's gorgeous! I love the curtains, free is good! I'm working on my room, and have decided to take out the carpet based on your post. What a great idea. What are the dimensions of the room? Love, love, love your new sewing room. Oh my. How tidy it is! Gotta go now -- gotta go clean up my "dump"! Thanks for inspiring me. The only word I can think of is "WOW"! This space is wonderful. 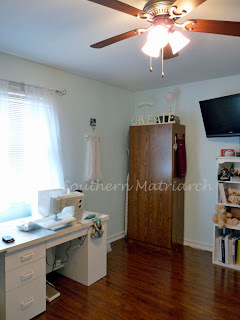 I wonder if I could convince my husband to let me take over the entire downstairs family room that we hardly ever use to move my sewing space into? I doubt it! Right now, I'm in an extra bedroom downstairs and it works but after seeing your space, I'm rethinking what really works!!! Love the new space! Thanks for the wonderful cyber tour, but I would rather be there in person stitching with you. There does seem to be one thing missing: a crib or playpen for Evamarie. She needs her own little space for watching Mimi make her gorgous little confections! Send DH to buy that, and let's see what he comes home with! I have dreamed of such a room for years. I am now 83 years old and will be satisfied to visualize mine using yours as a guide. 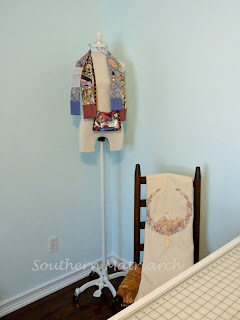 Isn't sewing a blessing? I, too use the Bernina 1130 and love it. I am not the seamstress you are but I never quit trying. Thank you for sharing your talents and your love of sewing. 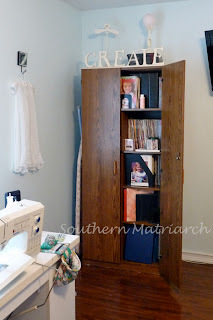 I love your sewing machine cabinet! I've been in the market for one and I love how yours holds two machines on a turntable how ingenious. This would save me a great deal of space in my soon to be sewing room. If I may be so bold, may I ask where I could purchase one just like it? Thank you so much for all the inspirations. I love your sewing room. I have such a small space. I am curious about your sewing machine. It looks like you have it on a slant. If so, how do you keep it slanted?